Annotation Studio is an open source web application under development at MIT HyperStudio. It is a collaborative, multimedia annotation platform that engages students in close reading and textual interpretation. It integrates a powerful set of tools with an interface that makes using those tools intuitive. Building on students’ new media literacies, Annotation Studio develops traditional humanistic skills including close reading, persuasive writing, and critical thinking. 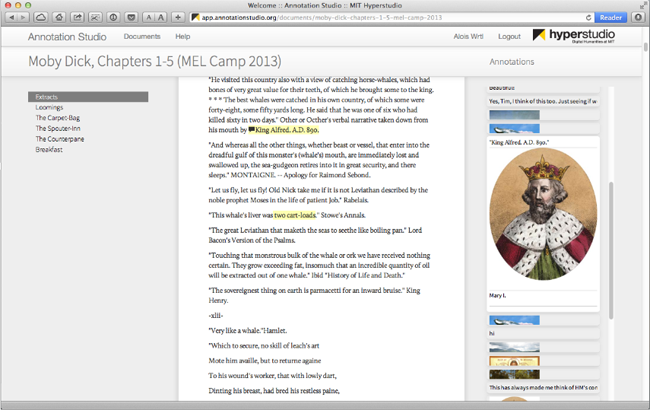 Features of the initial Annotation Studio implementation, supported by an NEH Start-Up Grant, include aligned multimedia annotation of written texts, user-defined sharing of annotations, and grouping of annotations by self-defined tags to support interpretation and argument development. Annotation Studio allows students to act as “novice scholars,” discovering how literary texts can be opened up through the exploration of sources, influences, editions, and adaptations. Annotation Studio is built in Ruby on Rails, extensively utilizing the Annotator.js library and participating in the surrounding Open Annotation community. Its custom data store is built in Node.js on top of MongoDB. See it on Github.